Today, I gave a short presentation/demonstration to a class of AVID students on alternatives to PowerPoint. 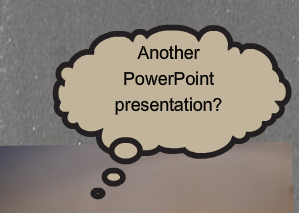 Starting with the mention of the familiar phrase "Death by PowerPoint" and a slideshare by Alexei Kapterev, I then discussed a few quick and easy options for our students. Descriptions of each after the jump, and a webpage with examples can be found here. Although this is essentially a slide presenter tool like PowerPoint, SlideRocket takes the entire operation to the cloud. However, unlike many cloud applications, this one looks and feels just like a full editor, complete with snazzy transitions and cool special effects. Granted, whenever I train on Google Apps, I usually downplay the need for such devices. Still, students often complain about the lack of transitions, so with SlideRocket, you can have your cake and eat it too. I have been a huge fan of this application from the first time I used it. Having created several videos for applications, including my Google Teachers Academy submission, I've enjoyed watching Animoto grow and mature to include more themes, a tighter interface, yet still maintain a positive brand presence for education. They are very quick to approve accounts for education, and you get a 50-user code for your classes to upgrade to their plus plan which includes unlimited full length videos. I'll be honest in that I haven't jumped on the Glogster train, but I included it in case students had experience with the tool in middle or elementary school. To me, it seems a bit chaotic, right down to the dashboard where you are frequently encouraged to upgrade your free basic subscription multiple times. Still, I do like the creativity that students can display when making their posters, and the ability to easily add media makes the tool attractive (but potentially distracting) to viewers. I used to promote xtraNormal, but when they decided to more down the paid route, I quickly found a free and potentially better application in GoAnimate. The premise is similar in that you can simply add text, scenes, actions, and you've got the making of an animated movie within minutes. Compared to my experiences with xtraNormal, I found GoAnimate to be faster, more responsive, and overall a better product. Here's hoping someone doesn't create an iPhone commercial and crash their servers. Do note that there is still a potential cost element in GoAnimate, and today, I did experience some lag time on their Text-To-Speech component. UPDATE 2/25: GoAnimate4Schools offers a free account for teachers and their students for animations up to 2 minutes long. I just applied and will update this post when I've received access received access within a few days (as notified). They said that it will take a few days due to a high demand.